I've been using my sewing machine! Fay has been teaching me - and is a much better teacher than that dragon in my textiles class at high school! 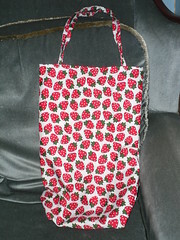 We made this strawberry bag together. She did one of my straps for me, and helped me to measure out the whole thing too as well as teaching me how to set up the machine and use it in general. It's not perfect, and I think I need to get much better at attaching straps. I think I need to work on wider ones for a while before I will be competent at thin ones like these. But it's not half bad!